Hi everyone!!! I'm back and having more Fun With Alcohol Inks!!! This technique is just as easy and creative as the other techniques I shared in Part 1 and Part 2. 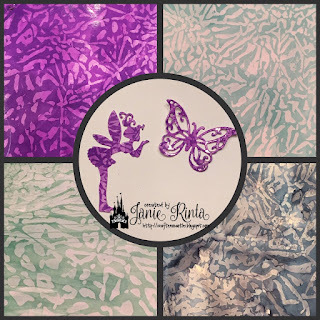 This time I'm using the Wax Paper Resist technique....and as with the other techniques I've shared, there are so many ways to use it In my videos I am using glossy cardstock, but you can use anything non-porous such as ceramic tiles, glass, metal, etc. If you use glossy cardstock then you can create awesome backgrounds for cards, scrapbooking, and mixed media, or you can make die cuts with character, like I did with the pixie and butterfly above. CLICK HERE to watch my YouTube video tutorial. Who doesn't LOVE their pets!!! 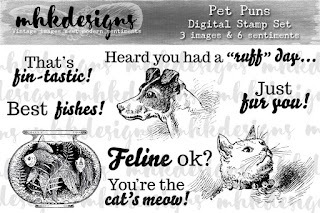 MHK Designs new release Pet Puns is irresistible!!! 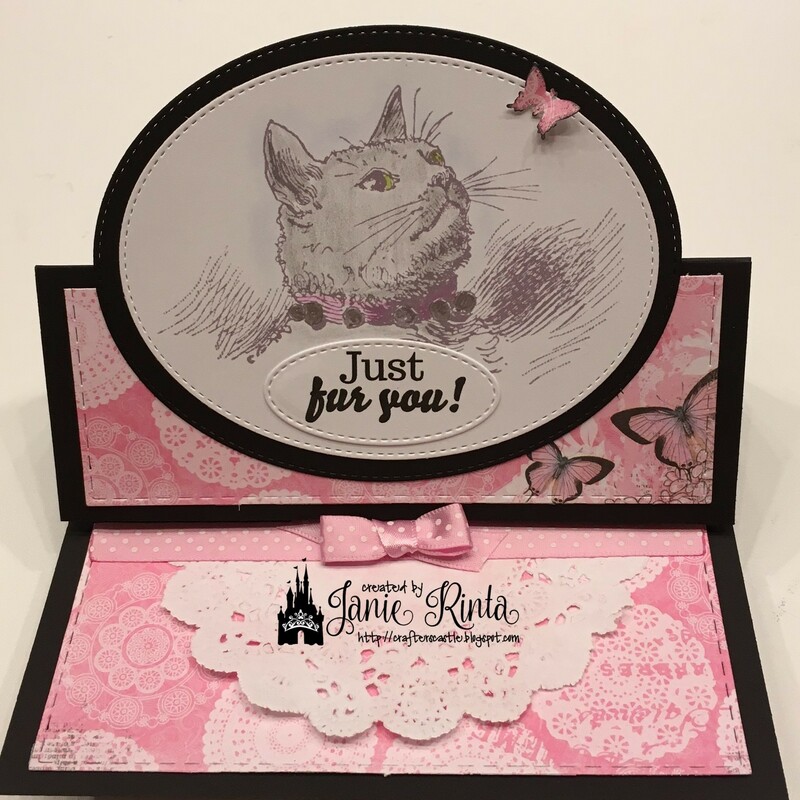 I couldn't wait to use this set to make a card for my dear friend that loves cats. I made this adorable Pop-Up Easel card for her. 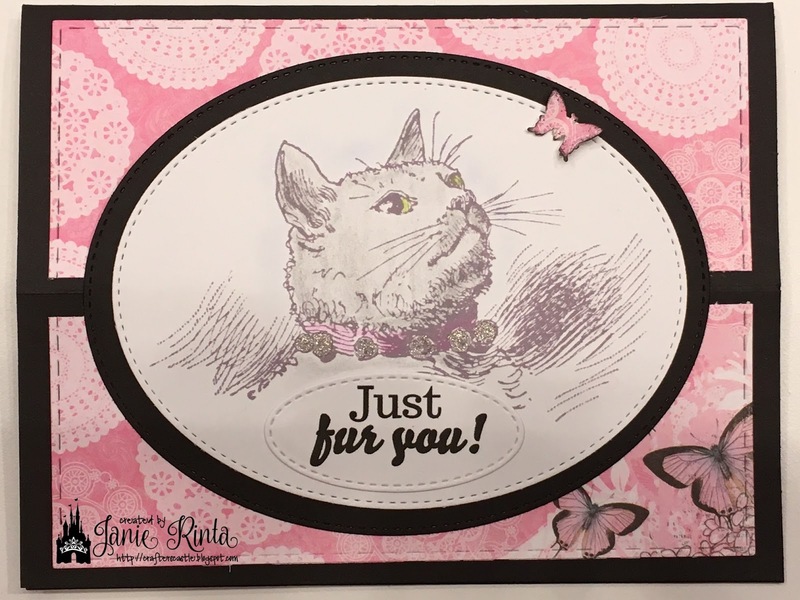 I printed the image in dark gray and softly colored it with colored pencils....gray for the kitten, pink for the collar, and green for the eyes. I used silver glitter gel pen to color the bells on the collar, but it doesn't show up well in the pictures. I also light chalked with blue around the kitten to give it some dimension. I used my stitched oval dies to cut out the black oval layer, and around the kitten and a small oval for the sentiment. I punched a tiny butterfly from the pink paper and inked the edges with "Black Soot" Distress ink so it would match the butterflies on the paper and placed it above the kitten's head so it looks like that is what she is looking at. On the bottom I added a doily and ribbon, then attached a bow to hold the easel open. I love Love LOVE how this turned out and almost hate giving it away...but I know my friend will love it. LOOK FOR A TUTORIAL ON MAKING POP-UP EASEL CARDS COMING SOON TO MY YOUTUBE CHANNEL! 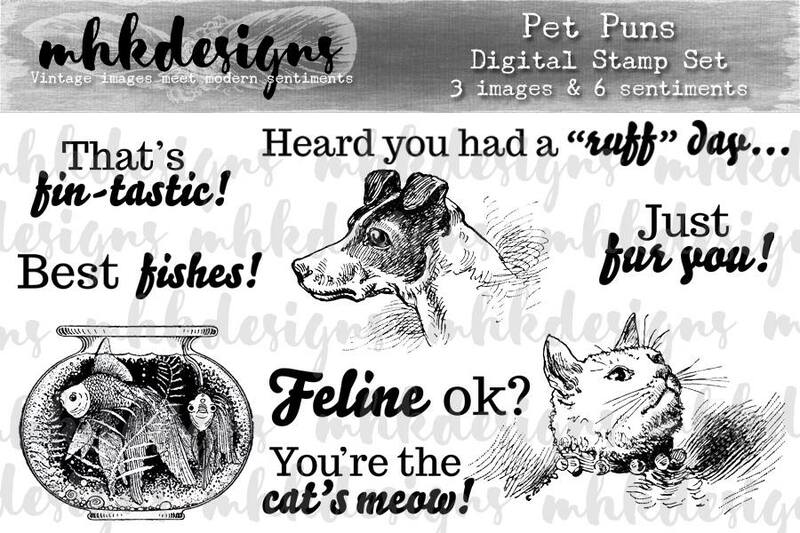 This is DAY 4 of MHK Designs August Release Party ! 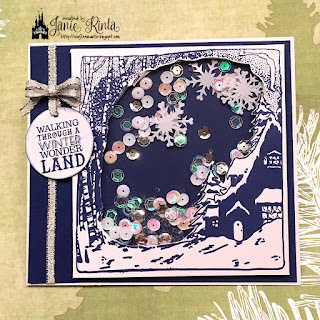 To see all the wonderful creations the Design Team has created you can start at MHK Designs Blog where you will find links to everyone's blogs. Also, below are details on how you can WIN one OR all of August's new release sets!!! 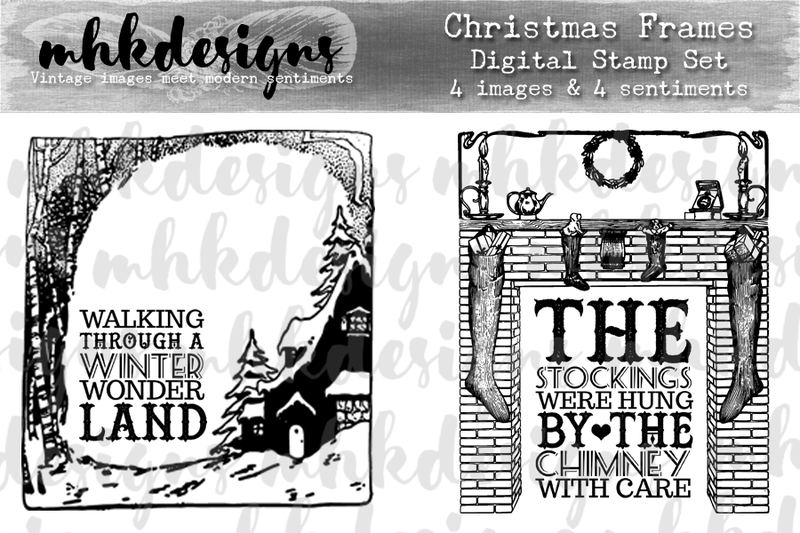 Leave a comment on the MHK Designs Blog. Leave a comment on each DT member's blog (see list on MHK Designs Blog). 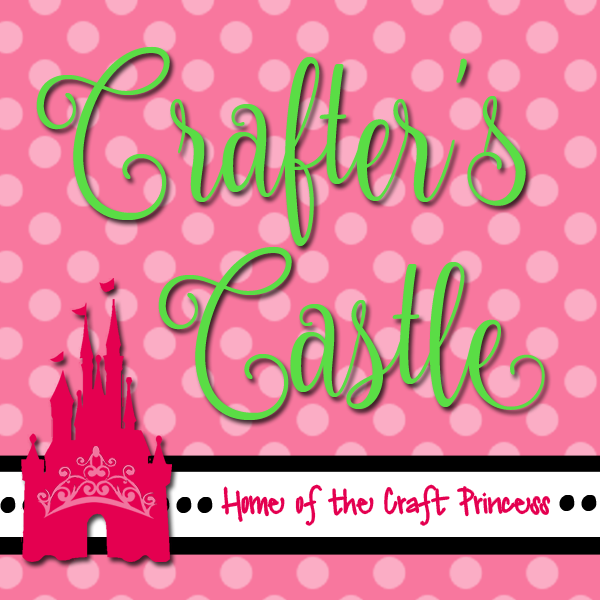 Join our MHKDesigners & Friends Facebook group and leave a comment there. Mynn will randomly choose the winning comments from all these places after the release is over. The best way to win is to comment every day. 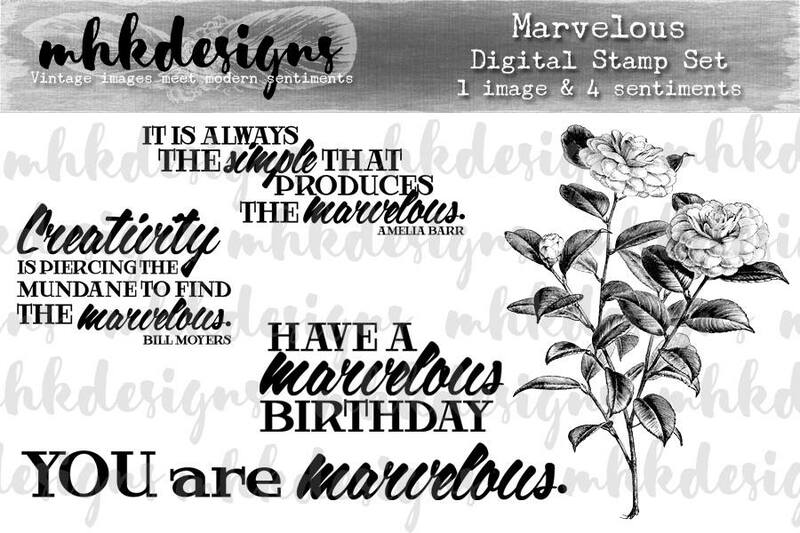 MHK Designs August Release Day 3 - Marvelous!!! 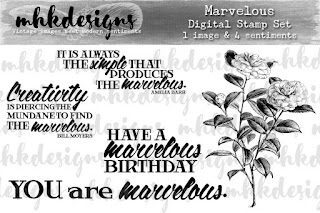 Flowers are always a MARVELOUS addition to any card or scrapbook layout....and this new digital stamp set, Marvelous from MHK Designs is no exception. I decided to make a sweet and simple card and let the floral image speak for itself. I used a Cuttlebug embossing folder to create the white background layer of the card to not distract from the floral image. I used my Cricut Explore's print & cut feature to cut out the flowers, and then colored them with colored pencils. I gave them a coat of matte Mod Podge to add a subtle shine and make the cutout a little sturdier. 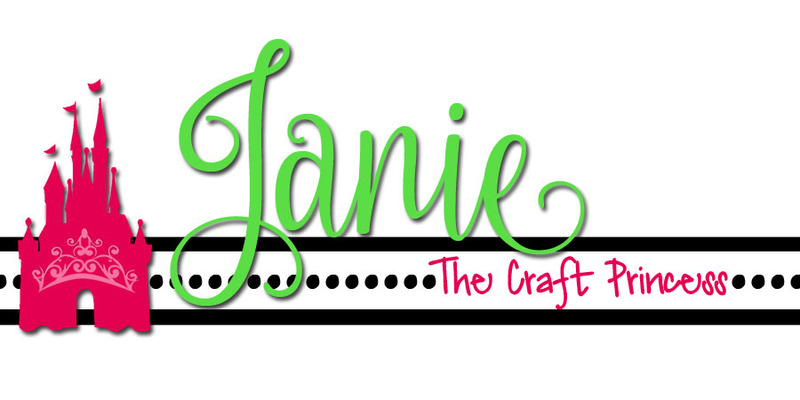 I used my stitched oval dies to cut out the green and white ovals. I adhered the green oval directly to the card and the used foam tape to pop up the white oval for dimension. I then partially glued the flowers to the white oval, leaving parts of the flowers and leaves slightly raised for a more realistic look. 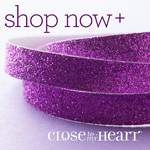 And finally, I add a lavender bow and the tag with the sentiment. I love the way it all came together. 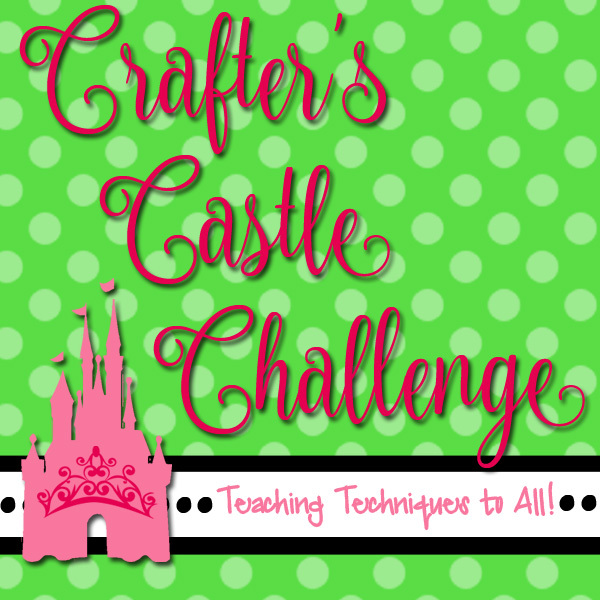 DON'T MISS THE CHALLENGES I'VE ENTERED LISTED BELOW!!! 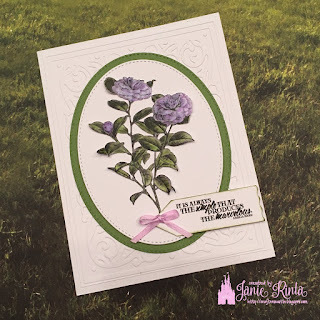 This is DAY 3 of MHK Designs August Release Party ! 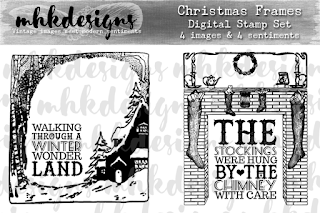 I love Christmas and MHK Designs just released a new digital stamp set called Christmas Frames that I absolutely LOVE!!! There are so many possibilities with this set!!! Here is one of the cards I made using it. I cut out the center of the scene so I could turn it into a shaker card. I put a variety of sequins (white, silver, and irredescent) and some snowflakes in the shaker to add to the winter scene. I put the shaker off center leaving a strip on the left where I added a silver ribbon & bow and attached the circle with the sentiment on it. From the moment I saw the Christmas Frames set this is what I imagined. I absolutely LOVE it!!! CLICK HERE TO WATCH MY YOUTUBE TUTORIAL ON MAKING SHAKER CARDS. This is DAY 1 of MHK Designs August Release Party !